"Caramelised cherries with amaretti semi freddo…"
How odd! It looks like you may have to take a leap. . .or perhaps they ran out of money before they got to the ground floor. Interesting shot. Great photo – my guess is that it was blocked off for security reasons! Have a lovely week. lol I guess peeps have to jump! You twirl around like a maple pod in the wind :-). Love this shot. A rather ornate fire escape to nowhere….great perspective for your photo. 🙂 Fire escapes are that way so people from the street can't climb up into your apartment. If there was an emergency you're supposed to jump that last story! I love the spiral though, it's very unique. Claire. I like the color edit you used. Neat picture. Funny shot… guess you have to jump! Haha!! Obviously they don't like going out!! Great photo – and amazing non-functional staircase – but who cares, it looks great and is more interesting that way! That is an awesome picture – one can wonder allright what the point is 😀 sometimes there is no point at all but it looks awesome. Splendid!! I love the textures in this photo! Thank you for sharing! Jump?? 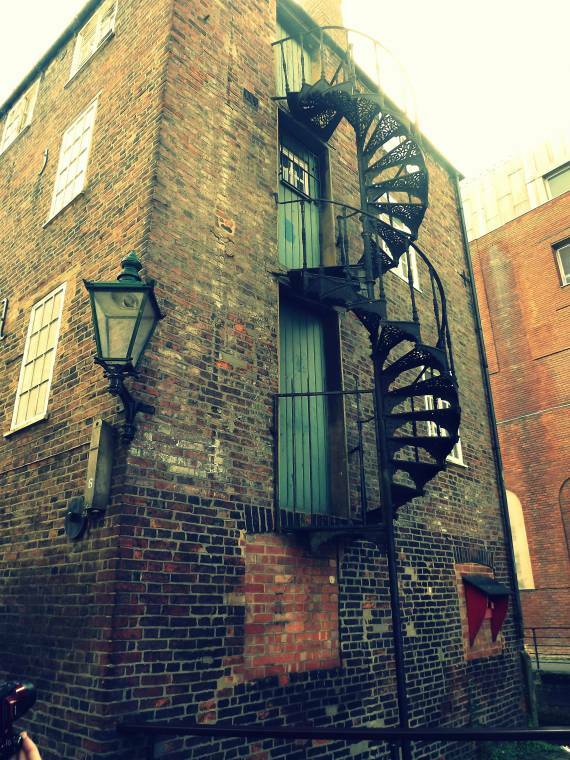 Love that spiral fire escape, how unusual! Thank you for sharing on Weekly Top Shot #42! good posting about"How Do You Get To Ground Floor? "